Step 1: Separate 1- 6 cans without lids and sand with a file to remove all metal burrs that may have left over to cut the cover. 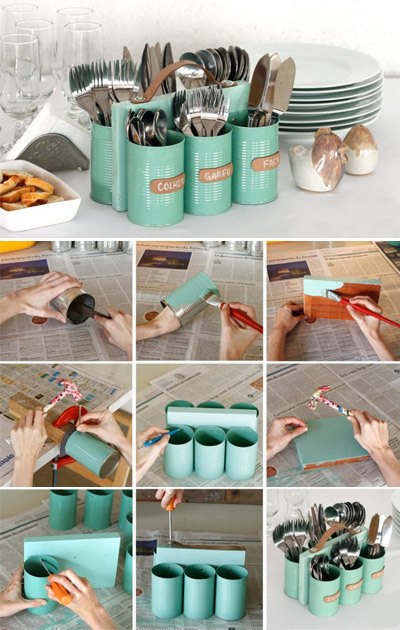 Step 2: Paint cans inside and out, the colour you prefer with synthetic enamel paint and allow to dry for one day. The synthetic enamel protects the metal from moisture, preventing rust. Step 3: Take your wood block and paint with synthetic enamel. Step 4: With a thick nail and a hammer, drill a hole in the can and then thread the screw. Step 5: Make 6 holes in wood using hammer and nail. Step 6: Put the screws into the holes of a can, and screw onto your wood block. Repeat for all cans. Step 7: Screw your piece of leather onto the wood block to make a handle, using your nails and hammer.